When you think of adding features to Adobe Photoshop, you generally think of plug-ins, like those offered by Alien Skin Software, Flaming Pear or onOne Software, all of whom offer excellent plug-ins at a reasonable price. There’s more to improving Photoshop than just adding plug-ins, however; specifically, I’m referring to Photoshop Actions and Styles. Photoshop Actions are basically a “recorded” set of instructions on what to do with a particular document and saved in a way that lets you apply these instructions automatically. Actions can be based on the tools built into Photoshop or may rely on third party plug-ins, but most can run out of the box with no further fuss. For in-depth information on Photoshop Actions and how to use them, check out Trevor Morris’ extensive tutorial, titled Actions: Automating tasks in Photoshop. The first place to go to find actions is Adobe’s own Photoshop Exchange, but prepare yourself. Despite the fact that this is from a company that is supposed to be Web-savvy, the site loads slowly and is poorly organized, with horrible navigation. You can’t use your browser’s Back button, and both the type and preview images are tiny. But, if you can get past all that, you’ll be treated to over 5,000 action files (assuming the numbers are correct), most of which are free to download. If you’re looking for other sites with actions—free or otherwise— check out PicsToBits; the P2B Perfect Skies, an action for improving the skies in your photos, is a good one. Outside of Photoshop Exchange, the place that has the most useful and creative actions for me, though, is PanosFX. Panos Efstathiadis, who runs the site, has a talent for creating actions, which is quite obvious once you use them. He only offers 34 of them for free, but they’re probably 34 of the best creative image enhancement actions available. For example, the image above took just a few seconds to create. 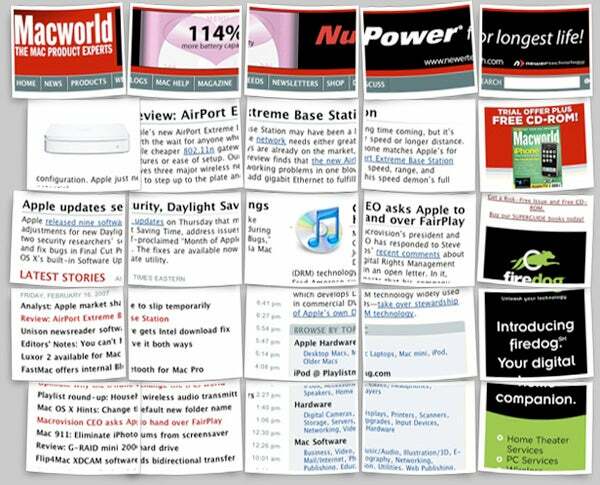 I took a screenshot of the Macworld.com home page and ran the B&Big Picture action. And, while you’re on Panos’ site, be sure to check out his small selection of action files that are available for purchase; many of them, like the Old Paper action, are quite nice. The image above shows off just a few styles applied to each letter of the Macworld logo. Each letter required only a single click in the Styles palette to instantly transform the plain black letter to what you see in the graphic. There are plenty of styles on the Photoshop Exchange site and I encourage you to look through them all: there are many that can save you time trying to get a particular effect. For example, if you’re looking for a brushed titanium face with chrome edges to add to a box or letter, you could apply the New Chrome Titanium style. And, one of my personal favorites, as is the Wood Style. Both actions and styles are easily installed simply by dropping them into your Photoshop - > Presets - > Actions folder or Photoshop -> Presets -> Styles folder and then loading them via the flyout menu in the Actions or Styles palette. For more stories on Photoshop actions, see Macworld’s Automate Photoshop chores, and Photoshop Automator action satisfaction.